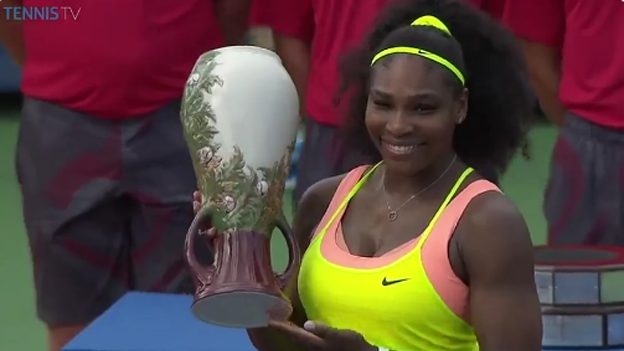 World number one Serena Williams beat third seed Simona Halep to win the Cincinnati Masters on Sunday. The 33-year-old won 6-3 7-6 (7-5) to see off Romania's Halep, 23, who had already secured second seeding for the US Open by reaching the final. Halep broke Williams in the opening game of the match, but the Wimbledon champion fought back, winning five straight games, and took the first set. They traded breaks to take the second set to a tie break, which Williams won. "Thanks to Simona for playing such a great match," said the American, who took victory in one hour and nine minutes. "I don't get great support everywhere I play, but I get so much love here I want to keep coming back." Halep said: "It was amazing for me to play in the final. Congratulations to the champion." The world number three threatened early in the second set when earning three break points in the opening game, but Williams rescued each one. It was then Halep who was rescuing match points in the tie break, before Williams secured a second successive Cincinnati title. It was the 69th singles crown of her career. That moves Williams, who heads to the US Open looking for a calendar-year Grand Slam sweep, ahead of Evonne Goolagong and into fifth place in the all-time list. 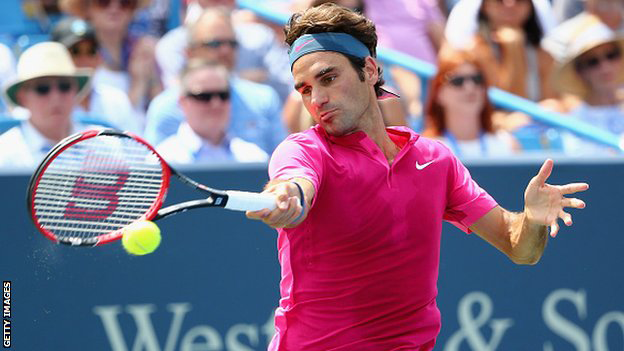 Roger Federer beat world number one Novak Djokovic to win his seventh Cincinnati Masters title on Sunday. The 34-year-old Swiss, who knocked out Britain's Andy Murray in the semi-final, recorded a 7-6 (7-1) 6-3 win. Djokovic lost the first set on a tie break, and the 28-year-old Serb then double faulted at break point in his first service game of the second set. Federer, who will now be the number two seed at the US Open, held serve to win in one hour 30 minutes. "We really get the best out of each other," said Federer, who made it an 87th tour-level title. "We have improved a lot playing against each other over the years. "It's very special for me. I will try my best to come back for many years to come." With the victory, Federer denied Djokovic from completing the set of all nine ATP Masters titles and took a 21-20 edge in career head-to-head meetings. "I really hope he (Djokovic) can win here one day," added Federer. "He deserves it." The win will also give Federer confidence going into US Open, which begins on 31 August, where he will be seeking a sixth title at Flushing Meadows and his first since 2008.